Have you noticed white or brown splotches on your child's teeth? If you're alarmed and beginning to think it is a form of tooth decay, you'll be pleased to learn it’s more likely a case of mild to moderate dental fluorosis. Fluorosis occurs when tooth enamel is exposed to too much fluoride early in its development, which may cause the staining you’re noticing. Fluorosis comes in four shades, if you will: very mild, mild, moderate and severe. In the first two instances, the mottling of the tooth enamel is hardly perceptible, and usually shows up as a faded white streak or spot. In many cases, your dentist or hygienist will be the first to notice it because of all the attention they pay to your child's teeth. The latter two, however, will certainly be noticeable to you because the discoloration will likely affect more than one tooth, and a larger surface area of enamel. Sometimes, the coloring can include the outlining of brown as well. With the severe shade, the predominant color is brown, and most certainly noticeable. 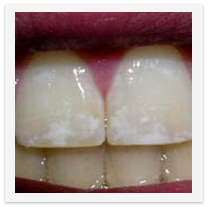 Since most cases of fluorosis are very mild or mild, most people live life little concern. In fact, most are oblivious to there being anything different about their teeth altogether. So, if your child isn't worried about it, you probably shouldn't worry either. If, on the other hand, your child is bothered by the appearance of their teeth, particularly if your child's teeth are shaded brown, then intervention can be a good option. That said, covering up a case of fluorosis is more difficult than you might think. The three favorable methods to correct it involve a bit of work and cost, but they can be successful. They are dental bonding, veneers, and deep whitening. Dental bonding: Dental bonding is the most affordable of the three. This solution involves removing a slight portion of the enamel and then filling it in with a tooth colored filling. The results match your child's teeth exactly, and can be a quick and easy fix. Porcelain Veneers: Veneers can be costly, and are not a good option on primary teeth. They can be a good solution for a teenager with fully erupted permanent teeth. Deep Whitening: Deep whitening, while it might seem like an easy fix, is often done with only limited success. In fact, the success rate can be so limited that some dentists will not even attempt whitening due to fears it can make the spotting more pronounced. This process can involve several visits to the office, in addition to proprietary whitening products. This type of deep whitening is most certainly not an over-the-counter remedy. Should you be interested in tackling a case of fluorosis, asking every question you have of your dentist is the best way to decide on an option.